While a lot of the world’s watches come from Europe, most of them come from Switzerland, or perhaps Germany. There are a few watchmaking companies located elsewhere on the continent, but there are relatively few of them from France. That’s where Pierre Lannier watches are made, however. Officially, their Website calls them Pierre Lannier Paris, and that’s where the company is located. 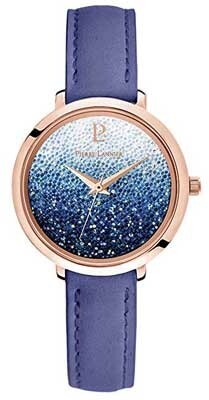 Pierre Lannier watches have been on the market since 1977, and while the company is well known throughout France, their watches are not all that familiar to watch buyers or collectors in other parts of the world. The company makes attractive, affordable watches in a wide variety of styles that should appeal to most everyone. Read on for the full Pierre Lannier watches review. The build quality is solid, as the company uses stainless steel for their cases. A few are plated, but they don’t use any precious metals in the cases themselves. The watch faces are protected by mineral crystal, which is more than adequate, though not nearly as scratch resistant (or as expensive) as sapphire crystal. Water resistance is good, though not spectacular, with most models rated at 30-50 meters for water resistance. This means that you can get them wet, but you should not wear them while swimming, showering, or diving, as that may damage the watch. 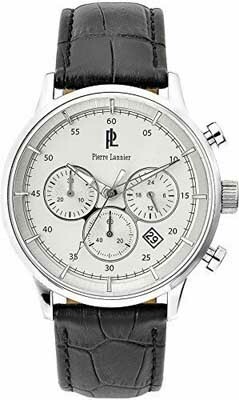 The movements used in Pierre Lannier watches are a combination of quartz electronic movements and automatic mechanical movements. The company’s official Website merely identifies them as either “quartz” or “automatic,” but does not identify the movements by name, nor do they indicate where they’re from. We’ve read that the movements are sourced from Asia, in which case we’d speculate that they’re Japanese in origin. Most of the company’s timepieces feature quartz movements, with the automatic movements used in just a few of the company’s more expensive watches. As Pierre Lannier watches target a relatively modest price point, you won’t find a lot of technical innovation in the company’s product line. Most of the watches are time-only, though a few include a sweep second hand, a date complication or chronograph complications. The styling ranges from classic and austere to interesting and sassy, depending on the model and whether you’re shopping for a watch for men or women. Bracelets are available in leather and stainless for men, and women’s models also include some with a ceramic bracelet. The men’s models tend to be conservative and traditional, with colors favoring the common black/white/silver/gold that you find in most watchmaker’s product lines. A few men’s models feature unusually large cases, measuring up to 49mm. That’s large even in a world where everyone seems to love large case sizes. They’re not all that large, however, and most are in the 40mm range. There are a few skeleton models in the product line, so if you like to see the inner workings of the movement, you’ll be in luck. Women’s models are a bit more colorful, though a lot of their models seem to favor a gold colored case and a white bracelet and face. As with the men’s models, the women’s models offer a few choices with a skeleton view. A number of the women’s models of are also decorated lavishly with Swarovski crystals. While there are no actual gemstones to be found in the product line, they do add a bit of shine and if you like bling, they might be a good choice for you. Care and maintenance is fairly straightforward, as most of the company’s watches feature quartz electronic movements. For those, you’ll need to replace the battery every 3 years or so, but aside from that, you won’t need to engage in any special maintenance. You should store your watches away from extremes of temperature and strong magnetic fields, as these can adversely affect the movement. With proper care, your watch should run well for years to come. 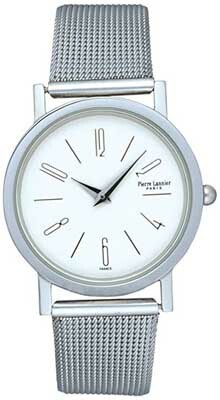 The warranty offered with the purchase of Pierre Lannier watches is the industry standard of two years. This will protect you from defects in materials and craftsmanship for the duration of the warranty period. As these watches are made with well-tested movements, defects are likely quite rare. As designer watches go, you’ll find that the pricing is moderate. You can easily spend tens of thousands for a watch, or you can buy a plastic one from China for three or four dollars. These watches fit comfortably in the middle, with prices ranging from a low of about $100 or so to a high of about $800. This makes them fairly affordable, and they make a pretty good watch at that price point. If you are in France, you’ll find these watches for sale just about anywhere that watches are sold, as the company has a significant presence in their home country, and there are stores throughout Europe that carry the brand, as well. We’re not aware of any brick and mortar retailers in the United States that carry the brand, but you can find them for sale at a number of online retailers, including Amazon. If you’re looking for a European watch and want one that isn’t going to cost you a fortune and perhaps want one that isn’t made in Switzerland, you might want to have a look at this brand. They make a number of watches in a variety of styles, in both quartz and automatic (self-winding) mechanical variations. The lack of precious metals and gemstones helps keep the prices down, and you’ll find that they’re quite affordable when compared with other European brands.